Cinders, you shall go to the ball! St Joseph’s Players invite you take a seat at the Hippodrome Theatre, Halifax Road, Todmorden, this week to enjoy their colourful and entertaining production of Cinderella. The show, produced by Julie Bates has the Players’ mixture of convincing and colourful characters and a strong and vibrant chorus who open the show alongside Cinderella, played by Lydia Bates, who effortlessly tells the story of a poor and downtrodden, yet kind hearted girl who is ever hopeful of meeting the man of her dreams. The plot follows the traditional fairytale with Cinderella living a poor life with her financially strapped father Baron Hardup, played by Ian Hill, and her extravagant and wicked step-sisters, Gloria and Venus, brought boldly to the stage by Colin Bates and Gill Lowe. The two spend the Baron’s money before he has a chance to pay the bills and make poor Cinderella’s life an absolute misery; she has some respite however with the lovelorn Buttons, played confidently by Hannah Sandiford, whose soft spot for Cinderella is obvious for all to see. Cinderella’s dream is to meet her true love, be they rich or poor. Luckily for her and her father this turns out to be in the form of Prince Charming, played with conviction by Abi Davy-Day, a confident character whose on stage chemistry with Cinderella clearly displays itself in a number of expertly performed duets. Of course nothing is quite straight forward and it takes the efforts of Dandini, played by Megan Hunt, the Prince’s confident and supportive Valet, and a sprinkle of magic from Cinderella’s enchanting Fairy Godmother, Isabelle Cannon, who waves her magic wand to make sure that in the end the path of true love is found. The show wouldn’t be complete without a couple of hapless characters, Dim and Wit, convincingly portrayed by newcomer Andrew Cannon and Harrison Cannon who provide a comedic link throughout the show. Every character adds to the overall quality of the performance and the stage staff certainly seize their opportunity to dazzle, with show stopping transformation to allow Cinderella to get to the Royal Ball. 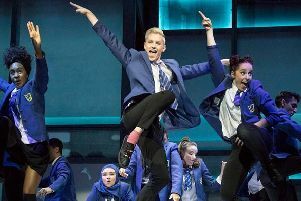 There are a number of toe tapping musical numbers and expertly choreographed dance routines put together by Megan Hunt and Starr Eames, to entertain and delight, from upbeat popular chorus numbers to skin tingling solos and duets. Cast and chorus are colourfully clothed in an array of costumes which alongside the fabulous scenery bring the show to life. Cinderella opened last night and runs tonight, tomorrow and Saturday (January 15, 16 and 17) at 7.30pm each night. There is also an extra performance with a matinée on Saturday afternoon at 2pm. Tickets are available online at www.cinderella2014.ticketsource.co.uk or from Todmorden Tourist Information Centre. Any unsold seats are available on the door.